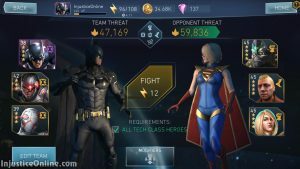 The next Single Player Injustice 2 Mobile challenge is here. You get the chance to fight for gold Powered Supergirl character shards and gear. 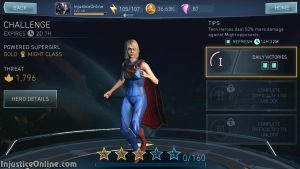 Critical hits on her most basic attacks grant Kara the chance to use her Walking Laser Ability for no power cost. Description: 10% Chance to Adjust Power costs by 100% on Basic, Jump, Rush, Ranged and Crouch Crit Attacks for Ability 1. 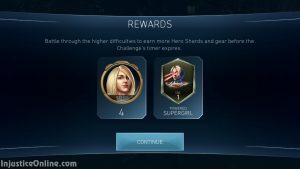 To beat this challenge you must have at one, two or three tech class heroes on your team, depending on the level you are playing. 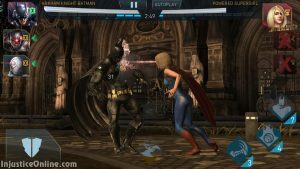 This shouldn’t be a problem even for newer players, as there are several silver tech characters: Batman, Deadshot, Green Arrow and Cyborg. This requirement might however limit the thread level of the team you will be putting together for this challenge. Anti-Might Field: Tech heroes on the player’s team deal increased damage when using Basic attacks and Abilities against Might opponents. Tech Heroes deal 50% more damage against Might opponents. Don’t waste your super meter on the weaker characters. 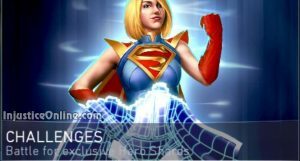 Build up to a super and attack Powered Supergirls with it.